Striking semi-manuscript school-girl map of Asia. 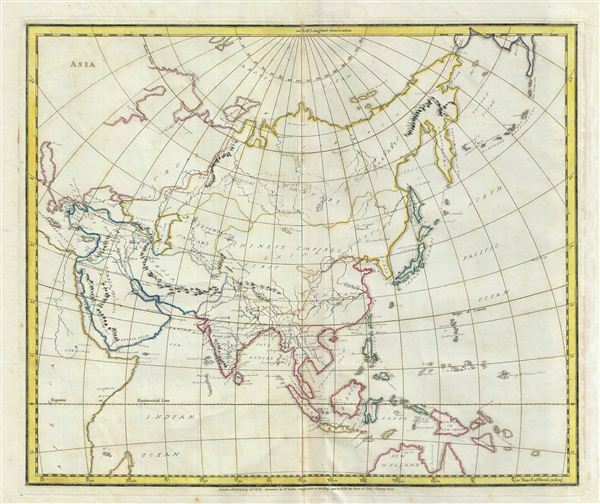 An unusual and beautiful semi-manuscript map of the Asia dating to 1823. The printed portions of this map follow the cartography of James Wyld and include the basic outlines of the countries, latitude and longitude lines, the Arctic circle, the Tropic of Cancer, and the equator. The remainder of the map, including all textual labels and color work, had been completed in manuscript, that is to say, hand drawn. Wyld most likely produced this map intentionally without labels for use as a classroom workbook by which children could learn geography by filling in the blanks. Very Good. Partial manuscript. Original centerfold. Platemark visible. Wide margins.